Nov 20 Firaxis Are Teasing Something Sid Meier's Civilization VI. New Expansion Announcement? UPDATE 3: Sid Meier’s Civilization VI: Gathering Storm announced. Read the details here. UPDATE 2: There’s now a timer now counting down to 3 hours. Tornadoes have appeared. Somehow seeming to hint some sort of disaster theme? UPDATE: The stormy weather now has streaks of lightning. 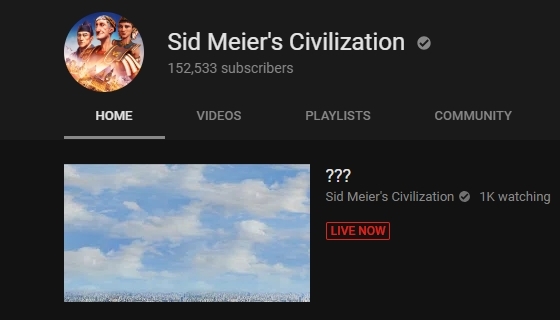 The Sid Meier’s Civilization YouTube channel at this moment has a live video that has been running for 11 hours now. No words, no hints… just an ominous dark cloud, stormy weather over a large city below. The thumbnail for the live video showcases the same scene but with white clouds and blue skies. There are no hints given on the official forums or fan forums. There are speculation that this is a teaser for a new expansion for Sid Meier’s Civilization VI. Civ VI has to date ony received 1 expansion pack with Rise and Fall. Most Civ games, receive at least 2 expansions. Civ V has Gods & Kings and Brave New World. It’s unsure what the imagery of a stormy weather over a city would mean. The first expansion, Rise & Fall centred around darks ages and golden ages, civs can fall into a dark age depending on how well they did. This blue sky, dark sky imagery seems to be closely related to Rise & Fall… perhaps. Maybe the new expansion (if it is an expansion… that’s purely speculation) will expand on Rise & Fall’s mechanics. Note that Rise & Fall was announced on November 28th, 2017… so it’s just round the same time this year. Either way, I’ll be updating this post when new info emerges. Stay tuned for updates.